Imagine having the ability to offer your customers uniquely configured promotions with virtually unlimited restrictions. From a simple BOGO "buy this one shirt, get this second shirt at 50% off" to a more detailed requirement such as "buy one of anything from the shirts category along with two pairs of pants and $25 worth of ties and receive $4.00 off each of any 12 pair of Dockers brand socks." even TIERED promotions. This opens up huge possibilities for marketing to your customers on the AspDotNetStoreFront platform. With a start and end date, you can schedule promos to run and expire in the future and they can even be triggered by coupon code. Don't contain your excitement... stand up, raise your fist and shout, "I'm gonna be a marketing rockstar!" Spend $10 on hats and get 10% off, spend $20 and get 20% off, or spend over $30 to get 30% off. This product must hook into the source code in a couple places - nothing too involved. If your site has customized and recompiled source, please contact us to discuss integration options. You get the idea. Now get the add on. Available now! Login with admin@test.com and vibeTe$t1. Please be considerate of other users and do not alter this password or lock out the account. 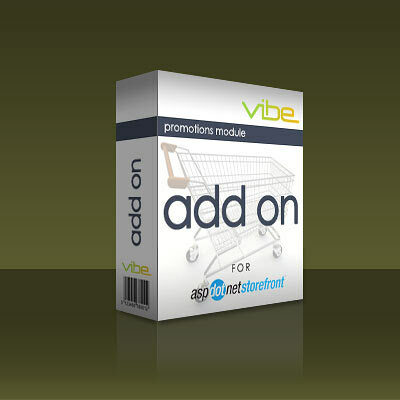 If you have trouble logging in, please contact support@vibecommerce.com.